As I am not sure how many works that I will get to I do not want to commit to a level of participation. I will certainly read and comment upon at least one work. Hopefully I will have time for more. This looks to be a very fun event. It seems that participants had a great time in previous years. I am not just looking forward to reading and posting myself, but I am also looking forward to reading commentary from the many other participants. I have a feeling that I may be discovering some great new blogs too. Thanks to Carl for hosting this fascinating read along. I recommend that anyone not familiar with Carl’s site go over and take a look. 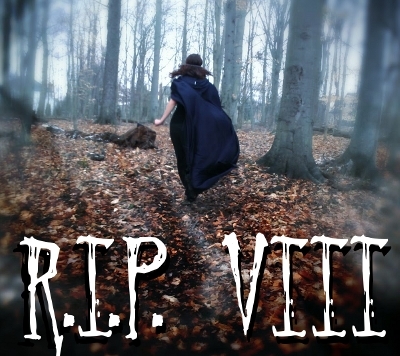 His blog also is a great place with an emphasis on science fiction and fantasy. As readers of this blog know, those genres are also very close to my heart. 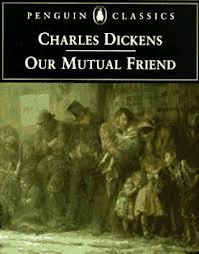 Our Mutual Friend was Charles Dickens’s last novel. I found it to be an engaging, entertaining and fun. The story and characters can best be described as lively and full of philosophy and symbolism that reach into the heart of Western culture as well as the human psyche. The book is full of both tragedy and comedy. As is typical of Dickens, it is peopled by a host of larger then life characters, ranging from the virtuous to the villainous. In some ways this novel is a series of case studies on what money does to people and how they react to it. Some behave horribly while it brings out the best in others. This is also an exploration of death, resurrection and rebirth, the power of books and learning, and a whole lot more. It is also a hilarious satire of upper class manners and lack of morality as well as a plea for social and economic justice. The plot is somewhat complex and includes lots of characters. When the old, rich and mean Mr. Harmon dies he leaves a last Will and Testament that sets things in motion. He bequeaths most of his fortune to his son, John Harmon who he all but abandoned in childhood. The inheritance is conditional on the eventuality that the younger Harmon marry the impoverished Bella Wilfer who he has never met. While traveling to meet his intended bride, Harmon is assaulted by thugs, knocked insensible and is mistaken for dead. Though he eventually regains his senses Harmon continues to uphold the fiction that he was killed and takes on fake identity. He decides to scope out Bella, from the point of view an uninterested stranger, to out to determine if she would make an honorable and virtuous wife. Meanwhile, the old miser’s servants, Mr. and Mrs. Boffin, inherit the fortune as per the Will, since the younger Harmon is presumable dead. Lizzie Hexam, the daughter of the man who is falsely accused of killing Harmon, and Eugene Wrayburn, the attorney handling Harmon’s Will, are also key characters as Wrayburn becomes romantically interested in Lizzie. Bradley Headstone is a schoolmaster who is also a psychotic stalker obsessed with Lizzie. The are numerous other important characters and lots of plot twists. I like complex characters. 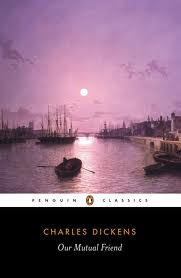 At times I have trouble with Dickens as he often portrays people as extremes of either reprehensible monsters or unquestioned saints. Thankfully this is not true of all of his creations. Those who fall into the grey areas particularly intrigue me. I was initially impressed by portrayal of the character of Bella Wilfer for these reasons. Early in the novel Bella is intelligent, kind and empathetic if a bit coquettish. She is not perfect however. She is also unabashedly greedy. She is searching for a husband whose main attribute is wealth. I love the unabashed, unashamed exuberance of the above! At the same time that she exhibits such avarice, Bella shows displays positive traits. She shows great tenderness to a dying orphan. She also has a strong bond with her hapless father whom she is exceeding kind to. This relationship is a bit unusual. She is extremely close to “Pa”. She confides her secrets to him. However, in some ways she treats him as a beloved child. She dotes upon him like a mother. At one point she bristles when his co – workers chide him. What a complex and in my opinion, realistic combination of traits that Dickens has endowed into Bella! Another aspect that enhances Bella’s character is that, as expressed in the above passages, she is self – aware. She knows that she is greedy. She also knows that this is a character flaw. At least in this part of the narrative, she accepts this about herself. But Bella is destined to disappoint me. Observing how mean and miserly Mr. Boffin has seemingly become as a result of his newfound wealth, and having fallen in love with the seemingly poor and disguised John Harmon, she decides to forgo riches in lieu of marital bliss. By the novel’s end she has transformed into a completely unselfish and self - sacrificing woman. It may seem odd that I am complaining that a character, with lots of redeeming qualities, forgoes a terrible character weakness in favor of virtue. Of course if Bella was a real person, I would rejoice that she had put aside such rapacious tendencies. However, when it comes to literary characters, I like a little darkness even in the best of them. A mix of virtue and vice makes a delicious and interesting stew. When characters become too good they become less interesting. Bella seems too real of a character for such a simplistic epiphany. Had she been a pure villainess she would not have been as intriguing either, it was the amalgam of traits, much like real person, that was unfortunately lost here. I am just being cranky on this point. This is a terrific and important work. Bella’s redemption is only a small part of the book. I must also admit that the transformation is appealing on some levels. A completely unimproved Bella might have been a disaster for the narrative. Perhaps however, in the end, a few materialistic tendencies in a partially changed Bella would have added some spice to the stew. 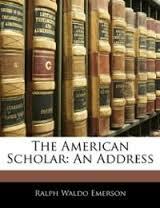 The American Scholar by Ralph Waldo Emerson was a speech given at Cambridge, Massachusetts in 1837. It has become a vital edition to the author’s canon. The work is an exploration of Emerson’s view upon an ideal thinker. Like much of Emerson’s work, it consists of stirring prose, it is thought provoking and it peers into all sorts of aspects of the human condition. I have been pondering just one of several main points that Emerson makes here. That is, what should the relationship be between the modern scholar and the books and the thoughts of humankind’s great intellects of the past. Emerson’s view is not all positive. I think that it first bears noting what Emerson’s argument is not parallel one to the currently popular anti-intellectual, anti-reading sentiment that I often hear that disparages books and deep thinking in general. Emerson certainly respects books, knowledge and learning as “the best of things”. He is, however, highly critical as to how folks employ it. Of course, in certain ways there is something to this point. I have known people who are too easily seduced by ideas. For instance, the person who reads a book on Buddhism and consequentially becomes a Buddhist for six months until they move on to some other philosophy, is not all that farfetched based upon my observations of certain individuals. I sense that Emerson is talking about more than this form of intellectual silliness however. As I pointed out in my commentary on Self Reliance here, Emerson can be, and is in The American Scholar, maddeningly unspecific. Where does the line between inspiration, which he advocates, and acceptance of ideas, which he excoriates, exist? If I read an author, reject most of his or her ideas, but agree with a few of his or her ideas and consequentially embrace that small fraction of ideas, is this the “bad” that Emerson is referring to? If not, at what point do I become a dreaded ‘bookworm?” What if I modify an author’s ideas and make them my own? Emerson gives few clues as to exactly what he is talking about. Emerson’s argument does fit very neatly into what is one of the main themes of his worldview. That is, that the individual needs to reject external sources of belief in favor of ideas that are self -formulated. Though most famously laid out in the appropriately tilted Self Reliance, this is a concept that appears over and over again in Emerson’s writings. I have argued before that Emerson sometimes has a great idea that he takes too far. Some of the above rhetoric, especially the blanket statement about the negative connotation of “accepting views” seems to smack of this tendency. On the other hand, though I do not always agree with him, I respect Emerson’s tenacious insistence upon an individual’s intellectual independence. Ironically, I suppose such admiration coupled with disagreement is exactly what Emerson is arguing for here. On a side note, I must comment that bibliomaniac is one of the most fun words that I have come across in a very long time. The Oxford Dictionary defines the word as someone who has a passionate enthusiasm for collecting and possessing books. Emerson seems to be using a slightly different definition here. I think that it is safe to say that quite a lot of my friends and readers fit the Oxford definition! With all of this said, a measured reading of this prose yields some very sensible conclusions. If we accept ideas too uncritically, we will be taken in by all sorts of questionable and contradictory beliefs and philosophies. When taken in moderation, Emerson’s exhortations would actually do many folks a lot of good. Though I often quibble with his ideas, I can generally agree with this thinker’s very famous counsel to “Trust Thyself”!